Stourwater Pictures is currently offering the DVD of the 54-minute film, Proof of Loyalty, to academic institutions, libraries, organizations, and the general public. Tax will be charged to buyers in Washington state. Shipping and handling added at checkout; it starts at $7 for domestic shipment of one or two DVDs. We use PayPal as our storefront for selling films, but you don't have to be a PayPal member to use it. PayPal is a secure sales site that takes credit cards. More fine print below. We do take purchase orders. If you have any problems ordering, want an alternative purchasing method (like POs), have special requests, or have any questions, please call 206.780.6928 (business hours Pacific Time) or email us here. Licensed for public performance rights for educational use in colleges and universities. 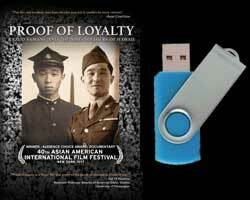 Includes DVD plus USB thumb drive with H.264 video file to be used in perpetuity. Licensed for private use. The Public Edition DVD is for home and personal use of the film only and is NOT licensed for school use, public or educational screenings. We also accept checks and purchase orders. Please contact us for details. When purchasing using a purchase order, we will supply you with an invoice and retain your order on file until payment is received. Digital Site License includes lifetime rights to show and/or stream the video file at a single institution.